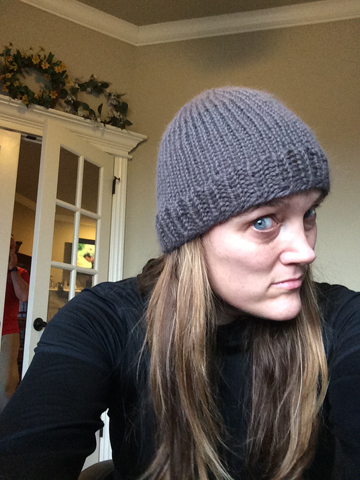 Knitted Running Beanie Hat / Cap — for Me! 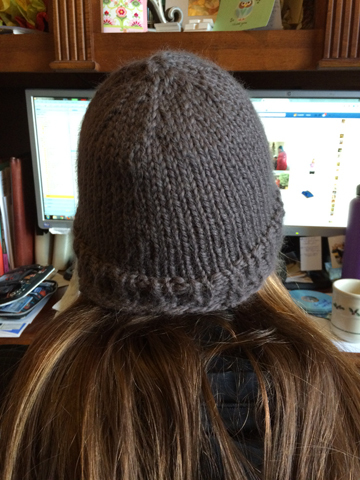 One of my resolutions for 2015: spend more time knitting. In several years (years!) 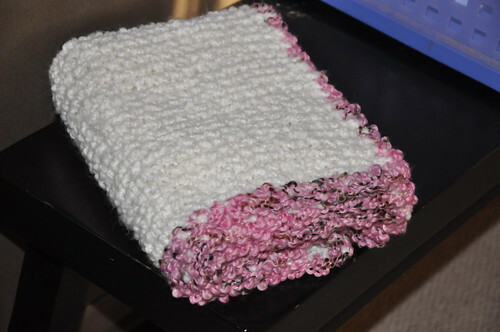 of knitting, I have never knitted myself anything but washcloths. Well, that ended Christmas Day 2014. 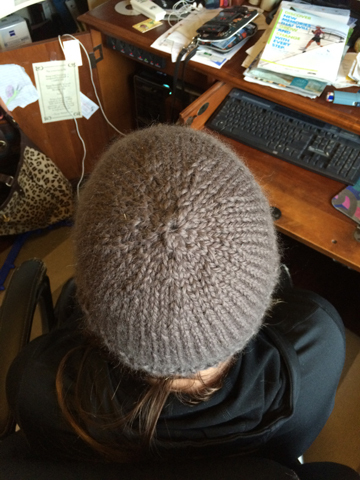 I was able to quickly knit up this gorgeous slate-putty-charcoal-colored squishy 100% baby alpaca yarn (Baby Alpaca Grande from Plymouth Yarn, color 2878) into a super soft and stretchy beanie for me to wear on runs, walks or around the house. I’m cold. I’ve absolutely been wearing this around the house! 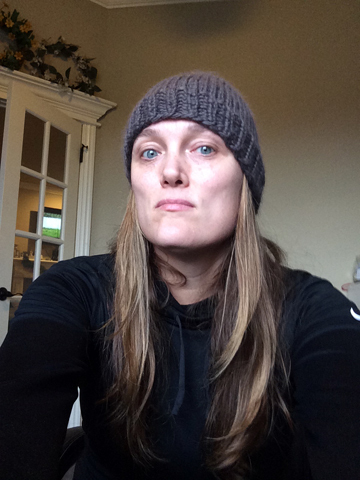 I’m so excited about this beanie and having finally knitted something for myself that I am even posting pictures without makeup and after a run. Yep. Au naturel. It’s SUCH a cute hat. And super-soft. I highly recommend this yarn and can’t wait to work up my other 5 skeins into a scarf, mittens, earband, headband, and perhaps even a hat to give away. If you’re interested in knitting, too, head on over to Ravelry and we can connect! I’m addicted and you should be, too. 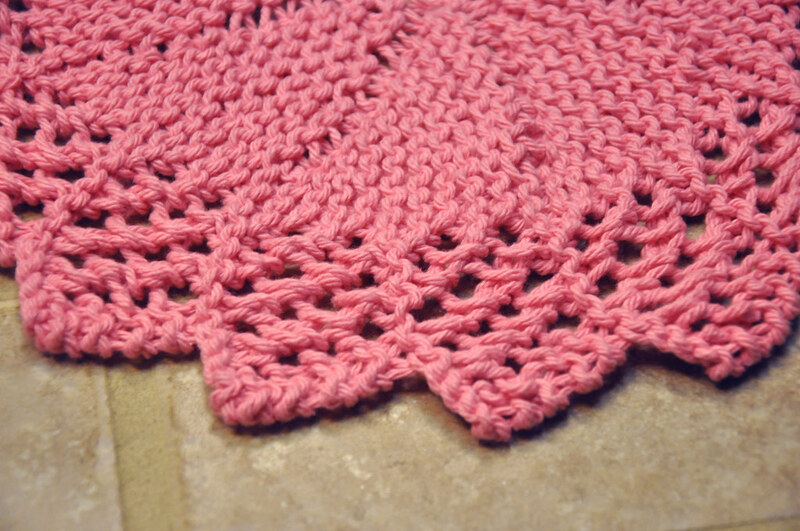 Knitted for Anna Prathipati’s baby girl coming in a couple of weeks. 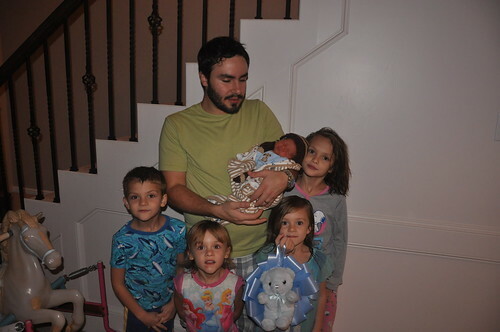 I missed the baby shower today but hope that I can still get it to her in time. I actually started a knitted dress but it is taking hours on end so I had to go back and get this white knitted blanket I had originally started for one (okay, two) of Don’s sisters and never actually got around to finishing. 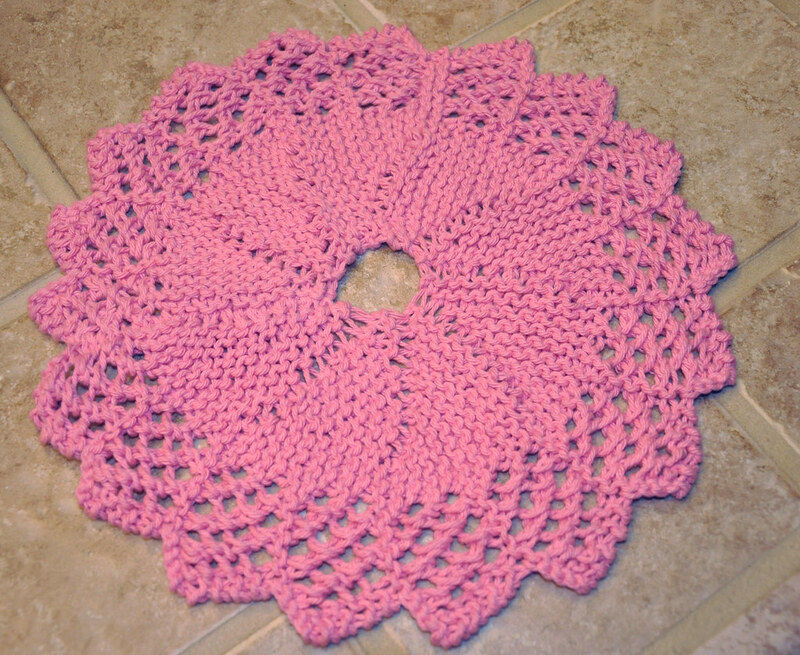 I decided to give it a pink crocheted camo edge and it is really, really cute. I made it at least 1 1/2 years ago and added the edge this morning. I love the Angel Fleece yarn – so soft but I must admit I still prefer wool as a natural fiber but you can’t beat the washability of something like this for babies! Here’s a link to the Ravelry page (be sure to favorite it if you like it!) and here is a link to the photos directly on our flickr account. The CUTEST (and my first!) 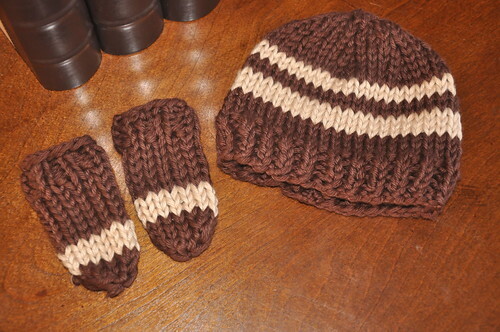 newborn baby boy hat and mitts. The hat is a variation of Susan B. Anderson’s “Go Team” hat published on her Spud & Chloe blog this past week. The mitts I made up but they seem to work well. 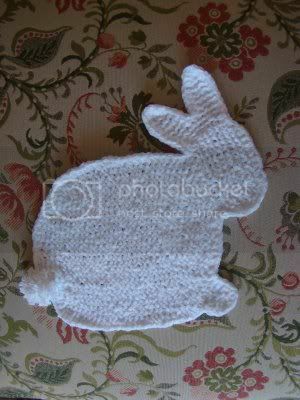 I might try lining those with polarfleece so that the yarns don’t catch tiny, fragile, newborn fingers. 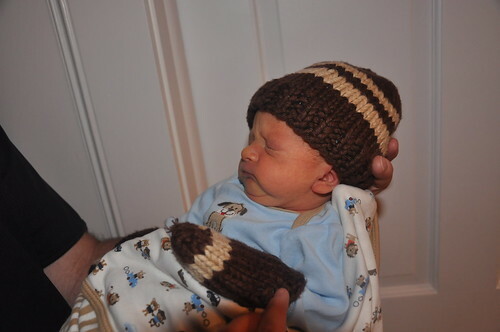 More pics of the sweet baby wearing the goods at my Ravelry account. Even more pics at our flickr account. 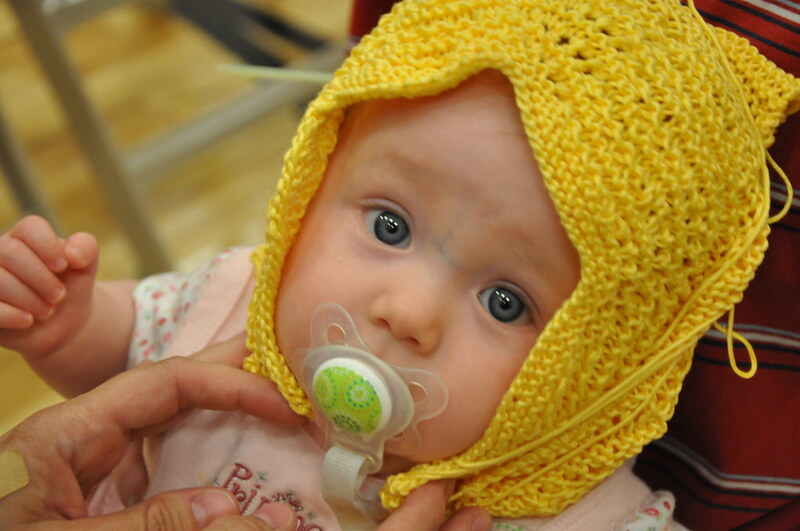 From the DROPS Alpaca baby bonnet pattern available for free. 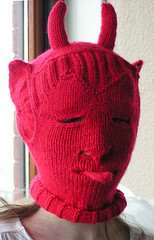 You can link to the pattern and other information about it at my page on Ravelry. It is such a cute pattern. Last time I worked it up in the recommended alpaca and it was very soft but this time I did it in sunny yellow cotton and I like this so much better with more distinct stitch definition – plus, I’ve had a bit of practice so it looks better all around. I haven’t finished the seams or picot edge but I wanted to try it on Megan’s cute little head – isn’t it – I mean she – adorable??? I’ve been gone for so long, I feel like I need to reintroduce myself! I have been more than busy this season and I’m going to have to change that. I definitely need to rearrange some priorities. I am determined to include more knitting time. I have so many great knitting links and blogs to share that I’ll just start off with a couple and give you time to enjoy them. Then I’ll list a few more next time. I hope you enjoy them as much as I have. First, check out Brooklyntweed. His name is Jared Flood and he’s on flickr, twitter, blogs and has a website. He teaches knitting but I simply enjoyed looking at his work. His technique is amazing and his color choices seem natural yet subdued and perfectly suited to the pieces he works. Love it! I wish he offered some free patterns but I couldn’t find any. I really enjoyed his circular needles version of the baby pants pictured above. The original baby pants pattern can be found from Shibui Knits out of Portland. I couldn’t find any free patterns on there site, either, but there is enough eye candy to inspire you for sure! 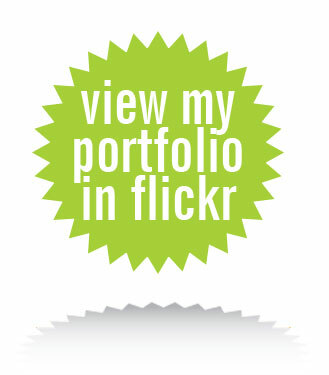 …or doilies…or decor…or a swag. Knit these up and make them whatever you want them to be! Sooo cute. 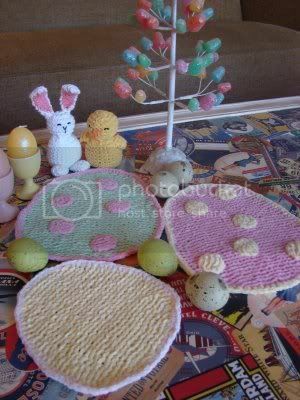 Thanks to Susan B. Anderson’s tutorials for the Easter Bunny and for the eggs. Just in time for spring!